Amalgam is a mixture of silver, mercury and other metals. Amalgam has been the filling material of choice for many decades to fill cavities and replace missing tooth structure. Silver amalgam has set the standard of care for fillings due to its ability to seal tooth structure and its durability. Local anesthesia is useful for dental treatment procedures such as fillings, crowns, extractions or placement of dental implants. Local anesthetics create a feeling of temporary numbness by blocking sensation from the nerve in the area of treatment. It is important to provide an accurate detailed health history to your doctor to receive the right type of anesthesia. For example, if you are being treated for certain heart conditions, a local anesthetic may be selected which does not contain epinephrine. Novocaine is a very common local anesthetic often associated with dental procedures. Local anesthetics such as carbocaine, lidocaine or septocaine are used today and are much less likely to cause allergic reactions. People with certain medical conditions such as specific heart conditions (including artificial heart valves) or total joint replacements of the knee and/or hip may need to take antibiotics before any invasive dental procedures. Some dental procedures including tooth extraction, dental implant surgery and dental cleanings may allow bacteria to enter the blood stream. The bacteria in the blood stream can eventually reach either the damaged area of the heart or the artificial joint and cause an infection. In the heart this infection is called “infective endocarditis” and may become life-threatening. With artificial joints, the infection may cause the joint to fail. The American Dental Association works closely with the American Heart Association to determine which people require antibiotic prophylaxis prior to dental work and which dental procedures present a higher risk and need antibiotic prophylaxis. These guidelines have changed many times over the last few decades with fewer heart conditions requiring antibiotic prophylaxis. Research has shown that there is a greater risk of a bad reaction to the antibiotics or the development of resistant strains of bacteria than a risk of infective endocarditis from dental work in people with minor heart problems. Although the ADA has worked with the American Association of Orthopedic Surgeons, the guidelines for antibiotic prophylaxis are still open to interpretation. There is a consensus that antibiotic prophylaxis is only appropriate for total joint replacements and that pins, plates or other orthopedic parts are not at risk. The most critical period for total joint replacements is the first two years, and it is agreed that antibiotic prophylaxis is necessary during that time. Specific antibiotics will be prescribed for procedures that may introduce a significant amount of bacteria in the blood stream. Ask your prosthodontist if you need antibiotic prophylaxis. The best method for treating an infection associated with a tooth is to remove the cause of the infection either by a root canal or removing the tooth. In some cases antibiotic therapy is also used to fight the infection, especially it has been long-standing or if the symptoms have become severe. If the infection has spread and the face begins to swell, antibiotic therapy is critical. Often a sinus infection can cause the upper back teeth to ache, but the problem is not dental related. Antibiotic therapy is necessary to successfully eliminate a sinus infection. Several antibiotics exist that are well-suited to treat dental infections, and your dental professional will decide the best antibiotic based on the type of infection and your medical history. Bonding uses tooth-colored filling material to change the appearance of teeth and improve your smile. For minor imperfections, especially in younger people, bonding may be the perfect answer to repair chipped teeth, close spaces between teeth and change the shape of teeth. The tooth-colored filling material used in bonding is a resin or plastic filled with glass beads that can bond to enamel that has been etched with a mild acid. If used carefully, the bonding materials may last for many years. Major changes in the shape and color of your teeth may require the use of porcelain or dental veneers, rather than bonding. Braces are used to help align and straighten teeth and position them to correct a person’s bite, while also working to improve dental health. They are often used to fix underbites, overbites, crooked teeth and various other flaws of the teeth and jaw. Braces can be either cosmetic or structural. Dental braces or orthodontic braces are often used in combination with other orthodontic tools to help widen the palate or jaws and assist in shaping the teeth and jaws. Orthodontics is a dental specialty that focuses on the study and treatment of improper bites, which may be a result of crooked teeth, an uneven jaw or both. Orthodontic treatment can be carried out for purely aesthetic reasons to improve the general appearance of patients’ teeth. There are also orthodontists who work on reconstructing the entire face rather than focusing exclusively on teeth. Traditional methods to replace a missing tooth or teeth include the fabrication of a bridge. To replace a missing tooth with a bridge, at least one tooth on either side of the space created by the missing tooth must be prepared for a crown. Then a false tooth is joined to the crowns, and the entire bridge is cemented to the prepared teeth. The patient cannot remove the bridge, and special aids are available to keep it clean. Patients are familiar with CAT Scans or CT Scans used in medicine to examine and diagnose conditions deep within the body, but this same computer-aided technology is available to dental patients for a complete analysis of the jaws, temporomandibular joints (TMJ’s), sinuses and the soft tissues associated with the mouth. Dental CAT Scans are more properly called Cone Beam Computed Tomography (also known as CBCT or a Cone Beam Cat Scan). CBCT is an advanced dental x-ray that shows the prosthodontist a large area of the patients head and neck areas in three dimensions. A Dental CAT Scan is used to analyse a person’s health or disease of their teeth, supporting bones, joints and implants. These CAT Scans have been very helpful in the correct placement of dental implants by allowing the prosthodontist to see and measure in three dimensions the hard and soft tissue of the jaws. The advanced technology of Dental CAT Scans is necessary for the production of guides for advanced computer aided dental implant surgery. To facilitate these procedures, CBCT/Dental CAT Scans are often available in a surgical prosthodontist’s office. Dental CAT Scans are made by rotating a cone-shaped radiation beam around the person’s head. This small amount of radiation is picked up by a sensor plate with the information processed by a computer and displayed in many forms and views on a computer screen. The advanced radiography of CAT scans causes some concern about radiation exposure, but compared to hospital CAT scans of the head and neck, CBCT/Dental CAT Scans utilize 1/30th the radiation exposure and provide equal results. Cosmetic dentistry consists of any dental work that improves the appearance of a person’s teeth, gums or smile. Depending on the patient’s desires, cosmetic dentistry may range from simple teeth whitening to bonding to porcelain veneers to full mouth restoration. The American Dental Association recognizes nine dental specialties, and cosmetic dentistry is not one of them. Prosthodontists are the ADA-recognized dental specialists with formal training in creating beautiful smiles. Visit with your prosthodontist to determine the best cosmetic dentistry procedures for your smile. Traditional methods to replace a missing tooth or teeth include the fabrication of dental bridges. To replace a missing tooth with a dental bridge, at least one tooth on either side of the space created by the missing tooth must be prepared for a crown. Then a false tooth is joined to the crowns, and the entire bridge is cemented to the prepared teeth. The patient cannot remove the dental bridge, and special aids are available to keep it clean. Dental composites are tooth-colored materials that consist of a mixture of glass and modern plastics. Prosthodontists use dental composites to restore teeth to their natural state by hand sculpting missing tooth structure to its original shape and color. A prosthodontist may also use dental composites to build, reshape or change the color of teeth. Dental fillings replace lost tooth structure due to dental decay or caries or fracture of the tooth. In advanced cases of lost tooth structure, porcelain or gold crowns and onlays may be required. In simple cases the missing tooth structure can be replaced with dental fillings using dental composites or silver amalgam. Amalgam is a mixture of silver and mercury and has been the standard material used for decades for fillings and to replace missing tooth structure. The advantage of silver amalgam is its ability to seal tooth structure and its durability. Dental composites are tooth colored materials that consist of a mixture of glass and modern plastics. Prosthodontists use dental composites to restore teeth to their natural state by hand sculpting missing tooth structure to its original shape and color. A prosthodontist may also use the composite materials to build, reshape or change the color of teeth. Depending on the health of your teeth and gums, you may need to visit the hygienist every 3, 6 or 12 months. At each visit we monitor your custom oral hygiene programme with a view to preventing dental problems rather than treating them years later. When a tooth is overly sensitive to cold or sweets the exposed tooth can be repaired with dental sealants. By using modern chemicals that can microscopically bond to the exposed tooth, a prosthodontist can help remove the painful symptoms of tooth sensitivity with dental sealants. Dental veneers are used to modify the shape and color of teeth. Dental veneers are thin shells of porcelain that are etched and then bonded to the enamel of the teeth. Tooth preparation is necessary to avoid over bulking of the tooth, but it is limited to the enamel and usually involves only a few surfaces of the tooth. Digital X-rays use low levels of radiation and an electronic sensor to create a black and white picture of the various structures in and near the mouth. Digital imaging is a relatively new technology in dentistry and offers features that enhance the viewing of any problem areas. Since digital x-rays do not use film, the images are displayed almost instantly on a computer screen and are stored in the computer allowing easy electronic transmission. Like traditional dental x-rays, digital x-rays are used inside the mouth to examine the teeth, the jaw bone and dental restorations. Dental x-rays, including digital x-rays, play an important role in the diagnosis of decay and failing restorations, the correct placement of dental implants and the proper treatment of teeth requiring root canals. Digital x-rays are utilized outside the mouth to evaluate the upper and lower jaws, the sinuses and the temporomandibular joints. Although all dental x-rays, including digital x-rays, use very low levels of radiation and are very safe, they should only be taken when necessary. The beam is limited in energy and focused on a very small area, reducing scatter radiation to surrounding tissues. Protective lead aprons can be used to cover various body parts such as the abdominal area or the thyroid gland when dental/digital x-rays are taken. Many people have an attractive smile with a few minor imperfections. Enamel shaping to correct these slight flaws can improve a person’s perception of their smile. Enamel shaping can correct uneven edges of the front teeth or round off sharp pointed tips of the teeth and make the smile more proportioned and even. It is important that the smile has some “character” and has some slight unevenness to make it look more natural. Endodontics is one of the nine dental specialities recognized by the American Dental Association. Endodontic treatment focuses on the tooth pulp and the tissues surrounding the root of the tooth. Deep inside the hard surface of a tooth is the pulp which contains blood vessels, nerves and connective tissue. The pulp extends from the crown of the tooth to the tip of the root, and it can become inflamed or infected from dental decay, trauma or gum disease. The irritated nerves of the pulp can cause pain, and chronic inflammation and infection may lead to a tooth abscess. The most common endodontic treatment is a root canal where all of the pulp tissue is removed from the tooth, the inner chamber and canals of the tooth are cleaned and shaped with special instruments and a filling is placed to seal the root. Although the tooth can no longer respond to temperature changes or feel a tooth preparation, the tooth can function for many years after endodontic treatment. Most teeth, especially back teeth, will need to be restored with a crown or cap following endodontic treatment. Most root canals resolve the inflammation and infection that cause discomfort, but there are times when the anatomy of the tooth or the persistence of the infection may require additional endodontic treatment. Often retreatment of the root canal will work, but chronic infection may need a more aggressive endodontic treatment. A common procedure in these cases would be an “apicoectomy” where the end of the tooth’s root is surgically removed and the root is sealed. Esthetic restorations can help you achieve a more natural-looking smile and improve your teeth’s natural beauty and strength. Prosthodontists can replace stained, chipped, missing or worn teeth with inlays, crowns, veneers, bridges and implants using the most advanced esthetic restorations to bring back your beautiful smile. Fillings are a procedure that replaces lost tooth structure often due to dental decay or caries. In advanced cases of lost tooth structure, porcelain or gold crowns and onlays may be required. In simple cases the missing tooth structure can be replaced with dental composite material or silver amalgam. Dental composites are tooth colored materials that consist of a mixture of glass and modern plastics. Prosthodontists use dental composites to restore teeth to their natural state by hand sculpting missing tooth structure to its original shape and color. In addition to fillings, a prosthodontist may use dental composites to build, reshape or change the color of teeth. Fluoride decreases dental decay. Since 1945 the U.S. Government has advocated the controlled addition of fluoride to public drinking water. In small amounts, ingested fluoride seems to strengthen the enamel while it is being formed in young children or pregnant women. Recommended levels of fluoride in water should range from 0.5mg – 1.0mg per liter of water with 0.7mg per liter as optimal. Too much fluoride in water will change the appearance of the enamel making permanent teeth look discolored and pitted. Applying fluoride topically to the teeth in the form of toothpaste or gels stimulates the re-mineralization of the enamel and topical fluoride gel can also decrease the sensitivity of exposed root surfaces. Fluoridation of water supplied by the government was quite controversial when the program was introduced in 1945. Even today some groups protest the mandatory addition of fluoride to public water. People with severe dental problems are candidates for a full mouth reconstruction. As the name implies, full mouth reconstruction refers to rebuilding all of the teeth in a patient’s mouth. Full mouth reconstructions combine esthetics with the science of restorative dentistry to improve the health, function and beauty of the smile. Crowns (caps), dental bridges, dental veneers and/or dental implants may be used in a full mouth reconstruction. In some patients orthodontics may also be employed to help properly position the jaw and align the teeth. Traditionally, inlays were used instead of fillings to replace a small amount of tooth structure loss due to decay. Like fillings, inlays fit inside the tooth and were made of gold. Today inlays are still used in the same situations, but the inlays are made of a tooth-colored material such as ceramic/porcelain or special dental composite. 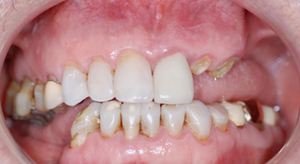 Defective or unsightly “fillings” can be replaced by tooth-colored inlays and bonded to the tooth. This bonding process may actually improve the strength of the tooth and help seal the inlay to the tooth. Onlays also fit inside the tooth, but extend onto the chewing surface of a back tooth to replace one or more cusps. In the past onlays were made of gold, but like inlays, more and more patients request a tooth-colored onlay. Making the onlay of ceramic/porcelain provides an esthetic alternative to gold and allows the restoration to be bonded to the tooth. This bonding process may actually improve the strength of the tooth and help seal the onlay to the tooth. Dental lasers are a new treatment option for many people and can be used to treat diseases of hard and soft tissues and teeth. The dental laser is a machine that focuses a beam of energy down a hollow tube of a thin strand of glass filament. The focused heated energy of a laser can melt and vaporize the tissue being worked on. During laser surgery, the laser cauterizes or burns off small blood vessels decreasing bleeding. The laser also kills bacteria limiting the potential for infection. Depending on the type of laser used, lasers can help prepare teeth for fillings, whiten or lighten your teeth, desensitize a sensitive tooth, sterilize bone for a surgical procedure, and remove gum tissues for major and minor dental surgery. One of the most common uses of laser surgery is the removal of unwanted or unhealthy gum tissue. Compared to conventional surgery used to reshape or remove the gums, laser gum surgery has many advantages. Laser gum surgery may reduce the need for traditional dental anesthesia during the procedure; decrease the amount of bleeding and swelling after a procedure producing less discomfort. Dental lasers are a new treatment option for many people that can be used to treat diseases of hard and soft tissues and teeth. The dental laser is a machine that focuses a beam of energy down a hollow tube of a thin strand of glass filament. This focused heated energy can melt and vaporize the tissue being worked on. It also cauterizes or burns off small blood and lymphatic vessels lessening bleeding and swelling, and kills bacteria limiting disease potential. Depending on the type of laser used, they can help with the preparation of a tooth for a cavity, the whitening or lightening of your tooth enamel, the desensitizing of a sensitive tooth, sterilization of bone for a surgical procedure, and the cutting of gum tissues for major and minor dental surgery. With laser surgery may also reduce the need for dental anesthesia, given your prosthodontist more control with bleeding, less swelling after a procedure and less discomfort. Mouth guards can describe many different devices that range from a simple commercially available athletic guard to a sophisticated guard custom made for a person with a history of teeth grinding or TMJ problems. In the dental profession “mouth guard” typically refers to a soft well-fitting device that is worn on either the upper or lower teeth to protect the teeth from trauma during contact sports or any activity that might result in a blow to the mouth or jaw. Although over-the-counter mouth guards are available at athletic equipment stores, your prosthodontist can make a custom-fitted mouth guard that will protect your teeth and adapt precisely to your teeth. The more sophisticated mouth guard designed for a person with a specific dental problem is usually called an occlusal splint or orthotic device. Nitrous oxide or “laughing gas” is given to a person with a mixture of oxygen and has a calming effect that helps anxious people relax during their dental treatment. When using nitrous oxide, the patient remains conscious and can talk to the dentist during their procedure. After treatment, the nitrous oxide is turned off and oxygen is administered for 5 minutes to help clear the system of any remaining gas. The effects wear off almost immediately allowing the person to drive home following the treatment. Nitrous oxide rarely has side effects when given properly, although some people may experience minor nausea. An occlusal splint or orthotic device is a specially designed mouth guard for people who grind their teeth, have a history of TMJ pain and dysfunction or have completed a full mouth reconstruction. An occlusal splint is custom made using detailed study models on an instrument called an articulator that simulates the movement of the jaws. The occlusal splint is made from a processed acrylic resin and is designed to guide the jaw as it moves side to side and front to back. This precise custom orthotic device not only protects the teeth from harmful habits, but it supports the TMJ and the muscles that are used in chewing. As permanent teeth develop the pits, grooves and fissures in some teeth are narrow and deep. Although the sharp cusps and deep fissures help in chewing food, the pits and fissures often become difficult to clean and trap bacteria. The trapped bacteria may directly lead to decay. To prevent decay or dental caries pit and fissure sealants are often placed in young patients. Pit and fissure sealants are bonded tooth colored materials that can be used to seal deep grooves and pits in tooth enamel. A pediatric dentist can thoroughly evaluate the grooves, fissures and pits for decay. If none have formed, the area can be cleaned and disinfected without the use of a dental drill. The tooth can then be sealed from bacteria reducing chances for decay. Radiography refers to the use of x-ray radiation to penetrate non-uniform structures and capture the images on either film or an electronic sensor. In dentistry, radiography may be either inside or outside the mouth and is necessary to make an accurate and thorough diagnosis. Like medicine, digital radiography is gradually replacing the traditional dental radiographs using film. Either technique uses low levels of radiation to create a black and white picture of the various structures in and near the mouth. Dental radiography is used inside the mouth to examine the teeth, the jaw bone and dental restorations. Dental x-rays, including digital x-rays, play an important role in the diagnosis of decay and failing restorations, the correct placement of dental implants and the proper treatment of teeth requiring root canals. Radiography is utilized outside the mouth to evaluate the upper and lower jaws, the sinuses and the temporomandibular joints. Although all dental radiography, including digital x-rays, uses very low levels of radiation and is very safe, x-rays should only be taken when necessary. The radiation beam is limited in energy and focused on a very small area, reducing scatter radiation to surrounding tissues. Protective lead aprons can be used to cover various body parts such as the abdominal area or the thyroid gland during procedures requiring radiography. For patients missing several teeth, but not all of their teeth, a removable partial denture may be recommended. This type of denture uses the remaining teeth to hold or anchor the removable bridge in place. There are many different types and designs for removable partial dentures. Typically, a removable partial denture is made of a metal framework with pink plastic to replace the gum tissue and plastic or resin denture teeth. The number of missing teeth and their location will affect the comfort and stability of the removable partial denture. The use of dental implants may increase the stability of a removable partial denture, or dental implants may be the best solution for replacing the missing teeth. Consult a prosthodontist to determine if a removable partial denture will satisfy your needs. A prosthodontist can offer you many designs for your removable partial denture or provide other alternatives to consider including dental implant-supported crowns and bridges. Like prosthodontics, endodontics is one of the nine dental specialties recognized by the American Dental Association. The specialty focuses on the tooth pulp and the tissues surrounding the root of the tooth. Deep inside the hard surface of a tooth is the pulp which contains blood vessels, nerves and connective tissue. The pulp extends from the crown of the tooth to the tip of the root, and it can become inflamed or infected from dental decay, trauma or gum disease. The irritated nerves of the pulp can cause pain, and chronic inflammation and infection may lead to a tooth abscess. When a tooth is overly sensitive to cold or sweets the exposed tooth can be sealed. By using modern chemicals (sealants) that can microscopically bond to the exposed tooth, a prosthodontist can help remove the painful symptoms. A very mild sedation agent, nitrous oxide or “laughing gas” provides a calming effect during the dental appointment and can be easily flushed out of the system to allow the patient to drive home following treatment. Oral sedation involves taking a carefully selected medication to help put a person in a more relaxed state. People that are having dental treatment completed under oral sedation will have to arrange for a ride as they would not be safe to drive themselves. IV sedation (intravenous sedation) provides for the opportunity to adjust the level of sedation medication based on each individual patient’s needs. For those having treatment completed under IV sedation, it is best to have a close friend or family member with you at the time of the procedure. At the very least it is mandatory to arrange for transportation. Many patients are unhappy with the appearance of their teeth and want a “smile makeover.” Often patients want “perfect” bright white teeth, but this type of smile makeover usually looks artificial and unnatural. What patients are truly seeking is a satisfying and esthetic enhancement of their smile that also retains a natural healthy appearance of their gums. 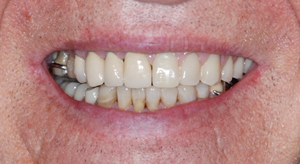 A prosthodontist has completed advanced training in the restoration of teeth to their natural form, color and function, and the ADA recognizes prosthodontists as specialists in this field, including smile makeovers. Visit with your prosthodontist about using dental veneers, bonding, tooth bleaching, crowns/caps to give you the smile makeover you desire. Often space maintainers are used in young patients who prematurely lose a primary (baby) tooth to keep the space open until the permanent tooth grows into the space. In adults a space maintainer is sometimes used after an extraction to hold the space open and prevent the teeth on either side of the space from tipping until the tooth can be replaced. A space maintainer is made of stainless steel and/or plastic. Space maintainers can be removable or cemented in a person’s mouth as a fixed space maintainer. Many patients are happy with their smile, but wish to brighten and whiten their teeth. Many products are now available for patients to whiten their teeth. These products include commercially available strips; custom fabricated trays with a bleaching gel or bleaching in a dental office using UV light or laser as the catalyst. There are limitations to these products. Visit with your prosthodontist to determine the best teeth brightening and whitening procedures for you. Cosmetic dentistry is not confined to the front of the mouth. Aesthetic, tooth-coloured restorations can also restore posterior teeth to their original appearance and strength. These restorations, made of either composite resin or porcelain, are biocompatible, strong, and much more aesthetic than traditional silver and gold and amalgam fillings. They are also very conservative, enabling preservation of healthy tooth structure. We are highly experienced in the cosmetic restoration of posterior teeth and can discuss with you the most appropriate restorations for your teeth when you come to see us. X-ray or radiography refers to the use of x-ray radiation to penetrate non-uniform structures and capture the images on either film or an electronic sensor. In dentistry, x-rays may be taken either inside or outside the mouth and are necessary to make an accurate and thorough diagnosis. Like medicine, digital x-rays are gradually replacing the traditional dental x-rays using film. Either technique uses low levels of radiation to create a black and white picture of the various structures in and near the mouth. Dental x-rays are used inside the mouth to examine the teeth, the jaw bone and dental restorations. Dental x-rays, including digital x-rays, play an important role in the diagnosis of decay and failing restorations, the correct placement of dental implants and the proper treatment of teeth requiring root canals. X-rays are utilized outside the mouth to evaluate the upper and lower jaws, the sinuses and the temporomandibular joints. Although all dental x-rays use very low levels of radiation and are very safe, x-rays should only be taken when necessary. The radiation beam is limited in energy and focused on a very small area, reducing scatter radiation to surrounding tissues. Protective lead aprons can be used to cover various body parts such as the abdominal area or the thyroid gland during procedures requiring x-rays.